Hi Karen, can you tell us about yourself and what inspired you to set up your business? Hi I’m Karen, I’m in my 50s, married to Paul and I have three grown up children who are all living at home; fairly typical of families these days! We also have furry family members … a dog and four cats and we all live in the beautiful market town of Alnwick. I would say that the desire to have a shop goes back to my childhood and is absolutely due to the influence of my Mum, Marilyn. 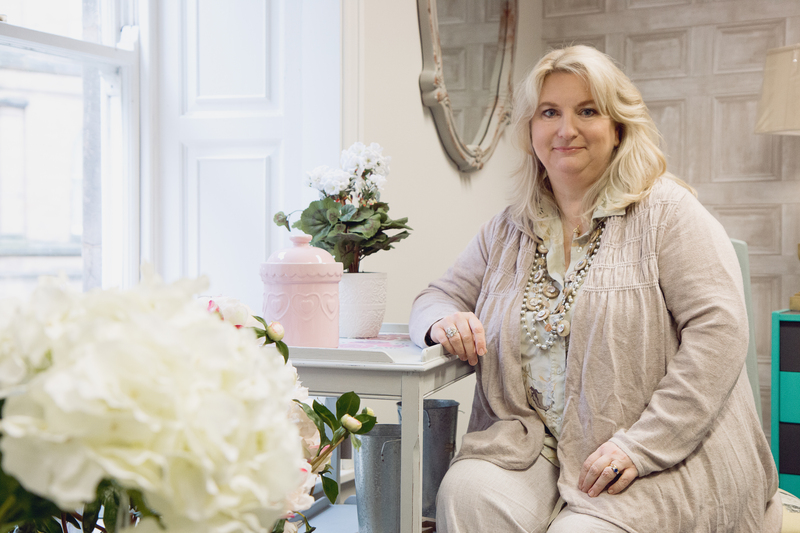 She used to drag me around antique shops, junk shops, car boot sales and charity shops on the one hand and other fantastic shops with gorgeous fabrics, clothes and interiors – you name it we went there! As a child, my clothes and belongings reflected the way my Mum bought things; on the one hand typical “second-hand Annie”, with clothes and toys from all sorts of places and on the other hand, exquisite things she’d saved for. My whole extended family are all the same – we like to have a mixture of total bargains found in thrift shops or car boots, mixed in with treasured finds from lovely shops. These are the kind of things that my family and I have grown up with and they are the things we love. That’s the important aspect to it as well; it’s about being drawn to something and really loving it, not because it has a value attached, but because it resonates with you and means something. The shop came about by a couple of serendipitous events. Whilst queuing outside The Maltings Theatre in Berwick at 5am, one cold February morning, to buy Michael McIntyre tickets I met a stranger and she has now become a very good friend. She introduced me to Annie Sloan Chalk Paint. Serendipitous event number 2 was another friend telling me that a shop I’d always loved was available to rent next door to her; she’d been nagging me to have a wool shop there for years. So I approached Northumberland Estates, the landlord, with a fire in my belly knowing this was a real opportunity to have the shop I’d always dreamed of. The landlord had just accepted an offer to let it out to somebody else, so we were in a competitive bid and I only had overnight to write something that would strike a chord. We didn’t have additional money to throw at it, so I had to really sell the idea of the shop and why it would benefit the town; I just poured myself out onto paper, being honest and also keeping in mind why this shop was going to be so special and beneficial. About a week later and to our delight we found out that my bid was successful. I opened the shop on the 4th August 2012, which was Paul’s and my 22nd wedding anniversary. I still remember the first customer coming in. She said, “Ooh what a lovely shop, what sort of a shop is it?”. My answer to her was that I hadn’t really got a clue what to call it; it was just a shop full of things I like. I’ve since come to realise that what we’re offering is a lifestyle shop. Before I opened Marilyn & Melrose, I hadn’t worked for a long time. I stopped working when I had the children and, following a number of tragic events within the family, my health took a turn for the worse. Throughout that time I was a mum and concentrated on the children. Then I found myself with children who were grown and no longer dependent on me to such a great extent. I was aware that I was feeling quite isolated, that my mind wasn’t stimulated and I really saw nobody. The challenge for me was to try and think of something that I could do, knowing that an employer wouldn’t take me on as my health is is so erratic. So, when the opportunity presented itself to have a shop and studio that wasn’t on the high street, in a very sweet location, I knew I’d found something that I could do, with my husband to support me on the days that I wasn’t able to go in. I’ve never regretted starting Marilyn & Melrose, it’s brought about huge benefits for me, my sense of well-being and for my family. The benefits have rippled out, I do genuinely love people and to be in the shop or workshop on the days I can do it is brilliant. Most important of all is to be driven by your passion and your gut instinct. What you end up doing may not be a career that you’ve had anything to do with before – it may be based on a hobby that you’re passionate about. If you are one of those people who manage to find something you love and can make a business out of it, then it is a truly great recipe for happiness and also hopefully success too. Success comes in all sorts of guises, but if it means your life feels rich in experience and you have enough to live on, well that’s success in my book. I’d also say never, ever, ever give up. I can’t stress that enough. If you have ten doors slammed in your face and everyone says no, don’t take no for an answer – speak to somebody else who will say yes, keep banging on doors and stick with it. We love your shop in Alnwick, it is full of so many beautiful things, and your workshops sound lots of fun too – what are the benefits of the internet for your business? We have been using the internet for some time with an e-commerce website. We also have a Facebook page and we use Instagram to share images of all of our new stock and to chat with our customers. We promote the workshops that we do on our website and social media platforms. Since embarking on the Be Digital programme I’ve discovered that we were utilising these internet channels fairly ineffectively and I’ve learned how to use these and feel more confident with them. My desire for our online presence has always been for it to reflect accurately the ambience and personality of Marilyn & Melrose and to be approachable to our customers. It’s still a work in progress. In terms of growing our business, the internet has become fundamentally important because an independent shop on the high street simply can’t expect to survive without it. What are your future plans for Marilyn & Melrose? I see Marilyn & Melrose, with my inspired head on, as being a miniature department store; customers are already saying that’s what it feels like. I also aim to expand the Well-being aspects of the studio, and we’ve already started holding meditation and mindfulness classes and Reiki workshops are next. We also stock crystals and aromatherapy oils and plan to expand the Mind, Body & Spirit side of things further. We are developing our workshops, and have invited guest instructors who are professionals in their field. These workshops will range from professional furniture restoration to crystal therapy. Marilyn & Melrose is about the whole person and is so much more than just a shop.